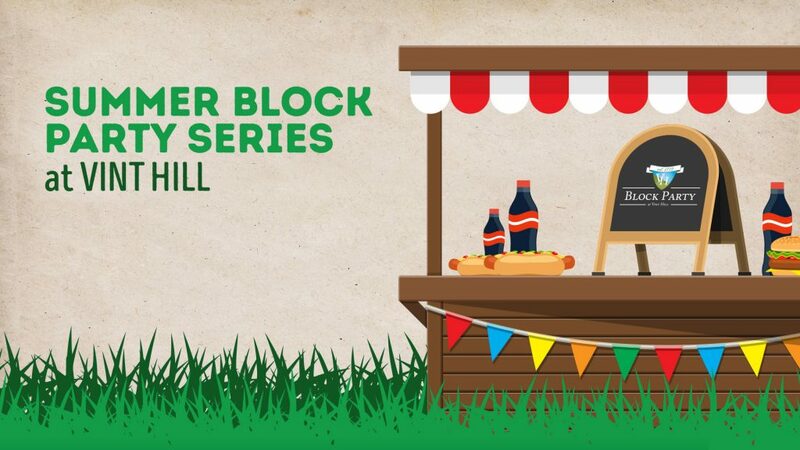 The second annual Summer Block Party series at Vint Hill kicks off on April 21. Building on the inaugural seasonal series that began last spring, the 2017 series has evolved to bring together the greater Vint Hill business community. The first block party of the series will feature Covert Café and Vint Hill Craft Winery. As an initiative that gives the businesses at Vint Hill an opportunity to collaborate with one another, each event will spotlight certain Vint Hill businesses that stepped forward to partner with hosts Vint Hill Village, LLC. The featured businesses will set up fun and exciting activities, live music and food built around a different theme for each event. Slated for Earth Day weekend, Covert Café and Vint Hill Craft Winery will accent the first block party with gift baskets, crafts and activities in the spirit of the environment. In another new element for 2017, the featured businesses will select a charity that will receive a portion of sales generated by food, beverages, and other items sold at the event. Covert Café and Vint Hill Craft Winery have selected the Sweet Julia Grace Foundation as their designated charity. Live music at the April 21 block party will be provided by Livin’ the Dream. While each block party will focus on a different theme and funds raised will benefit a different charity, some elements will stay the same from event to event. Each month will feature live entertainment, food by Covert Café and A La Carte Catering, beverages by Inn at Vint Hill, children’s activities by Fauquier County Parks and Recreation, as well as participation from other local businesses, such as Von Canon General Store, Cold War Museum, and Piedmont Dogs. This year’s series takes place at the Silvermead House, located at 4152 Aiken Drive, Vint Hill, VA 20187. Parties start at 5pm. All events are free to attend and dog friendly. The Summer Block Party Series is a precursor to the annual Vint Hill Fall Festival, which will take place on September 23, 2017. The creators behind the seasonal community events, Vint Hill Village, LLC, seek to enliven the former Army base as a destination point for New Baltimore residents to live, work and enjoy for shopping, dining, and entertainment, and a place for both small local and larger businesses to prosper.